In his Dish article for City Paper, Chef John Ondo — former chef-owner of Italian restaurant Lana — explained that he left fine dining to try something less stressful in the fast casual world. Enter Kairos Greek Kitchen, which I kind of wish they’d named Pan, God of Shepherds, Hunters and the Wilds, Express. Alas, no one asked me. And Kairos, which the interweb translates as “a propitious moment for decision or action,” is probably easier to remember. Walk in and you’ll quickly note it’s something of a Chios of Chipotles or Mykonos of Moe’s. That last one is no real surprise as Ondo’s business partner, Cary Chastain, is the owner and operator of all area Moe’s franchises. 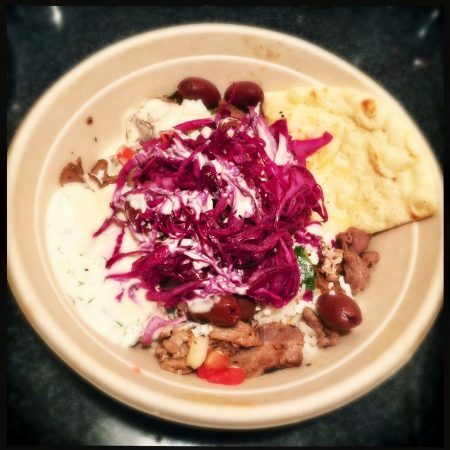 In typical fast-casual style, you approach the large glass case and find a menu divided into three base choices — a pita ($7.29) or a bowl ($7.79), which an be made with either basmati rice or salad of romaine or spinach. 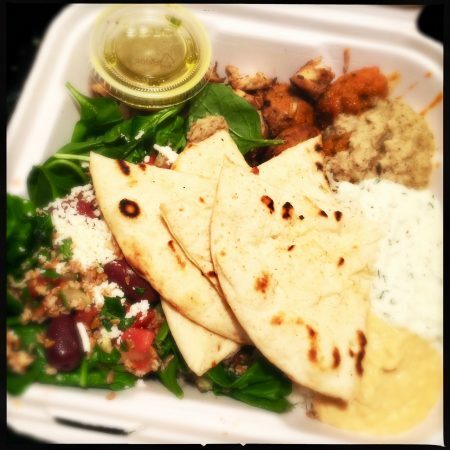 From there choose from four protein options — falafel, chicken, or meatballs, as well as lamb ($1.49 upcharge) — which can then be garnished with a host of Mediterranean-style toppings. Ondo’s lamb is slow-roasted and cut into tender chunks. It’s simple and well-seasoned, such that the flavor of the meat shines through. Unlike Greek gyros, traditionally made with shaved slices of rotisserie-cooked pork or American gyros, sliced from a spool of seasoned, minced lamb or beef, assembling a gyro-esque pita at Kairos yields different results. The meat portion is not large, so much of the sandwich ends up being more about the spreads and toppings than anything else. As for spreads, I went with the hummus, which is lemony and basic. Light on tahini and garlic, it’s perfectly serviceable. The Baba ganoush, made with airy mashed eggplant, is also lemony with just a hint of tahini. It’s surprisingly well-done considering the simple setup and wide swath of choices. Harissa, the red pepper-based condiment and foundation of Tunisian cuisine, also makes the “spreads” list and the sweet, spicy paste is a natural with falafel. Kairos gives you four crisp balls, filled with whole chickpeas and packed with the flavors of cumin and fresh parsley. 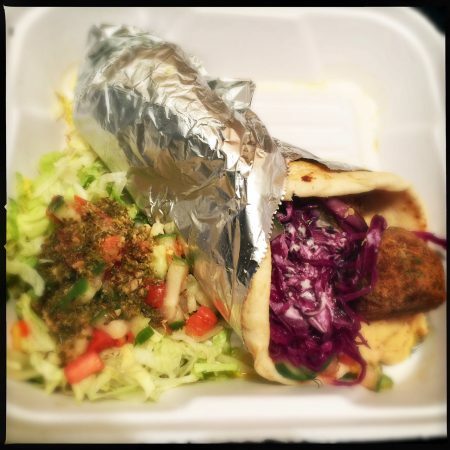 Possessing a lightly spicy finish, the falafel holds its own despite having been prepared an indiscriminate amount of time ago. Nothing beats crisp falafel fresh from the fryer, but if you don’t have that kind of time, this is a satisfactory substitute. Personally, I preferred the large pillowy pitas, but Kairos rice and salad options have their place. The array of spreads and toppings can quickly get overwhelming, so I was relieved when a friendly employee materialized from the back to help with my analysis paralysis. At her suggestion, I also added some tzatziki, the traditional Greek cucumber and yogurt-based sauce. Until I read otherwise, I was nursing a theory that someone tasted Chef Ondo’s tzatziki and said, “you gotta open a restaurant with this as the keystone.” Thick and garlicky, with thin strands of cucumber and dill, it’s excellent and should be ladled upon everything.Especially the chicken, whose hard seared-chunks were rather dry. A near-blank canvas for the toppings, it’s probably the protein of choice for anyone who doesn’t want to eat lamb or anything all that Greek, but the weakest overall. For my $7.29/$7.79, I’d ask for the meatballs. Hand-formed and cooked to medium, they’re served in a red sauce, which no doubt helped to keep them so tender and juicy inside. My favorite of the proteins, the only thing that might make them better is if there was a little mint, the way I remember keftedes in Greece. Toppings abound with feta cheese, kalamata olives and a light, bright tabbouli, and two of the strongest options were a cucumber and tomato salad and an intense purple Israeli-style cabbage salad. Former Lana lovers missing Chef Ondo’s gnocchi al funghi, bolognese or risotto of the day will find no reprieve from their longing here. However, for anyone in a rush in the southern part of Mount Pleasant and in the mood for some world-class tzatziki, the Santorini of Subways awaits.